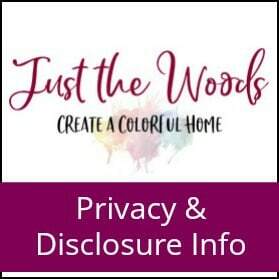 Disclosure: This kitchen remodel post contains affiliate links for your convenience. 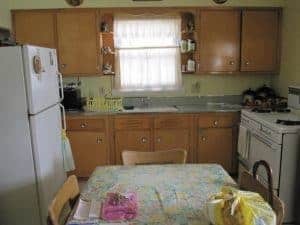 When we bought our house the kitchen was the original 1950’s kitchen. 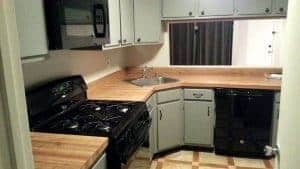 It was something out of a time capsule with the honey oak cabinets, mint counter tops, and vintage Caloric oven. 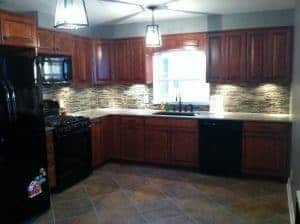 This kitchen remodel project was completed approximately 5 years ago and all of the work was done by my husband, Brian. To fully grasp the age of this oven imagine having to use a match just to light it! It also had two doors, once for cooking/baking and one for storage. No pilot light on this stove. Plus there was a string to the exhaust fan, so when you pulled the string the King air fan would open to the outside of the house. The yellow was a bit too, well yellow for my taste as well, and the layout was not functional at all. 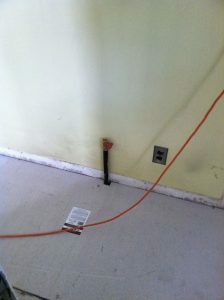 We had our work cut out for us, and for that I am thankful to have such a handy hubby. We made our way to Home Depot to sit down with the kitchen design people. 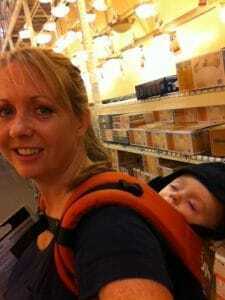 After so many trips to Home Depot during this project, Jackson would eventually just go to sleep on my back. Would you believe that my husband thought he could demo the old kitchen without taping off the door opening to the rest of the house. He said “don’t worry, it won’t be that dusty”. OH MY! Thank goodness I won that argument and the doorway opening was taped off. 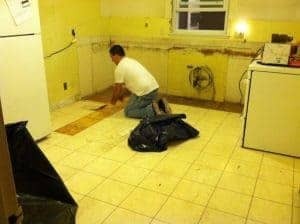 The original kitchen was completely gutted, cabinets removed, floor tile pulled up – soup to nuts – all gone. I was a little sad to see the old vintage stove go, but it was necessary since we couldn’t shut the oven door at Thanksgiving when we tried to cook a turkey since the oven section was so small. And thanks to that cheery yellow wall paint, many of my photos look yellow until we paint the walls. This little pipe in the floor may not look like much BUT we actually moved the gas line to relocate the stove to the other side of the kitchen getting rid of that U shape layout and opening up the room. 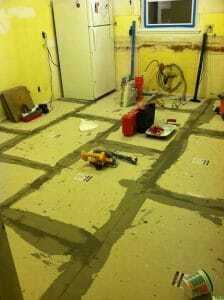 A mud floor was then put down before we could lay the new tile. My husband measured and remeasured and then backed himself into the corner while laying out the tile. 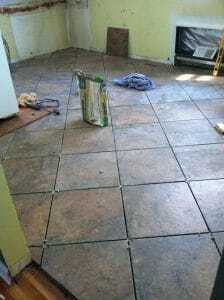 Once the tile was grouted and finished the cabinets went up. The cabinets are by American Woodmark – Alexandria maple Auburn Glaze. 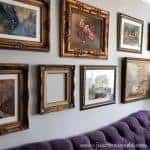 Brian actually put them up all by himself by building a giant T support and adding temporary level beams along the wall. He would wake up in the middle of the night and check his measurements and make sure the cabinets were perfect and level. Darn those yellow walls – they need to go. 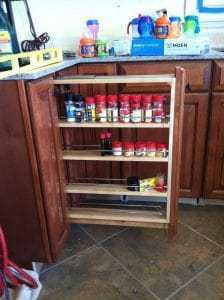 This narrow pull-out spice storage is one of my favorites. Those little containers of spices take up so much space in the cabinet. Whoever came up with this thing is pure genius! Don’t mind that ridiculous sippy cup collection. 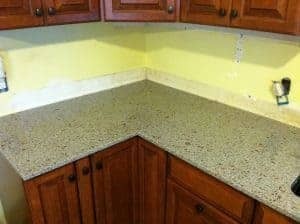 The countertops are made with recycled materials and are called Riverbed from Eco by Cosentino. 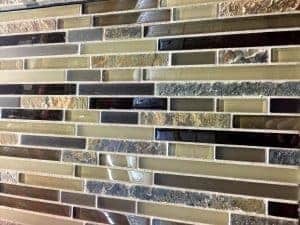 The backsplash went up next, along with under cabinet lighting. 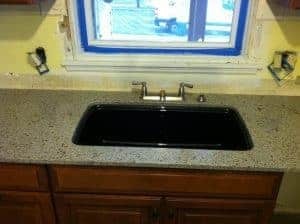 We opted for all GE appliances in the Adora line in black as well as a black sink and I love them. My mother kept telling me not to get black, but I followed my gut and got them anyway. 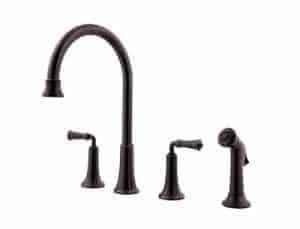 We originally chose a silver faucet but later swapped it out for a more appropriate fitting Tuscan bronze faucet. 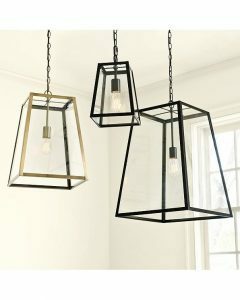 These great pendant lights were ordered online and work with both the coloring and the style of the new kitchen. That horrible yellow on the walls was finally covered with a very light gray. 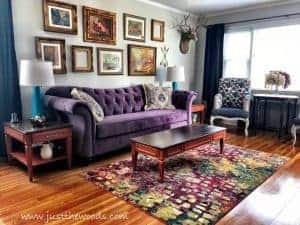 Our kitchen remodel feels like ages ago, and I’m shocked that I was able to search and find the actual products that we used in our kitchen remodel to be able to share them with you. 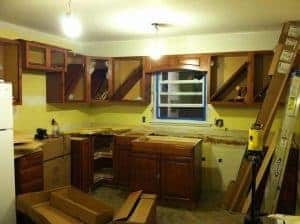 While this kitchen remodel was happening upstairs, I had a crock pot, a microwave, an electric griddle and small table set up in the basement with a one-year-old. It was interesting, to say the least. 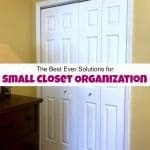 Though we didn’t necessarily do this project on a budget we feel that we saved by doing the work ourselves . Who am I kidding? I came up with the design and Brian did all of the actual work, I know when its best to stay out of the way. 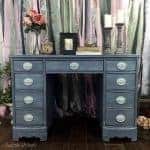 Even though this project was done 5 years ago, I wanted to share since I had documented the entire process. I used the photos to have a photo book made so we can always look back and see how much work went into the kitchen. In hindsight, I should have taken better photos. 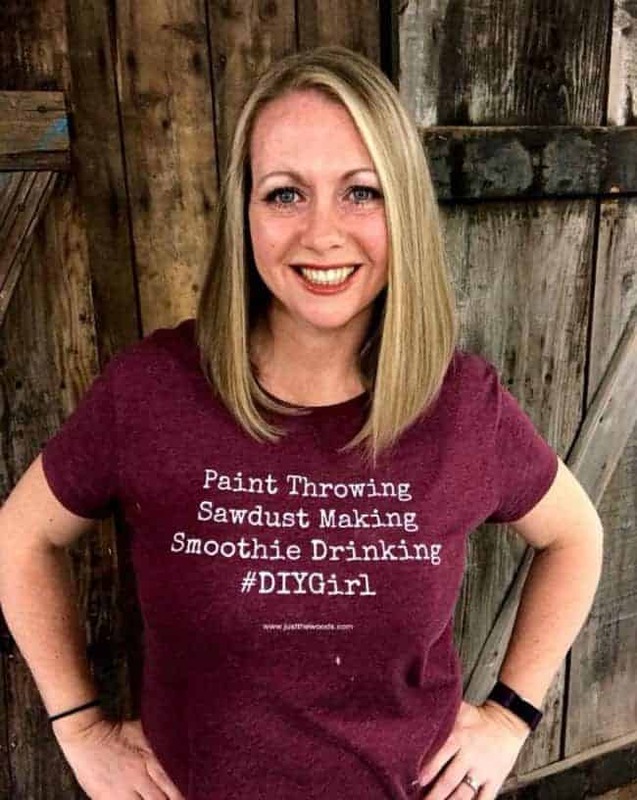 You did an awesome job (and your hubby). Looks great. 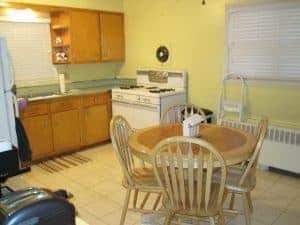 We did a total remodel in our kitchen, when my son was 18 mo. Old and it was interesting cooking and washing dishes, my son’s 19 now and it’s time for an upgrade. My husband did no work on ours haha which is a good thing! Wow! What a transformation! Your husband must be proud every time he walks in there. Big thumbs up to you both (the brains and the brawn). Fantastic job and the colors are great. 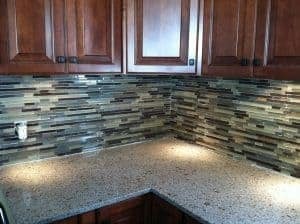 The backsplash is wonderful and makes the kitchen. 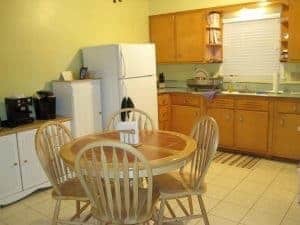 Awesome job and beautiful kitchen! thank you so much! Im so glad the major renovations are finished. 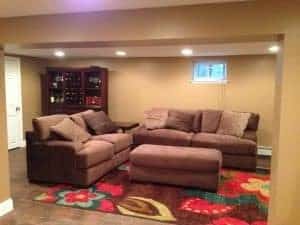 We also finished our basement, I may write about that as well since I have all the photos. It was a HUGE project! have a great week!